Until now we have mainly focused on systems submitted to unilateral constraints with codimension one boundary. In this chapter we investigate the difficulties encountered when several constraints are present. Some simple examples are used to introduce the problem. Then we present a general method, the so-called sweeping process, that consists of a particular way of writing the dynamical equations of systems with unilateral constraints, through specific measure differential inclusions. The chapter ends with the presentation of complementarity formulations of the dynamics of systems with unilateral constraints, and on the existence of solutions to such complementarity problems (related to tangential impacts). 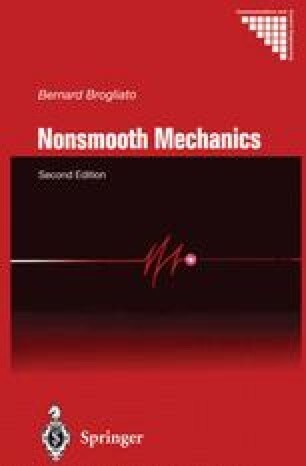 An introduction to various existing methods for the numerical integration of nonsmooth systems with complementarity relations ends the chapter.